The following post appeared originally on The Spirited Woman at the start of Arizona’s monsoon season. It’s finally fall…and the lesson endures the seasons. 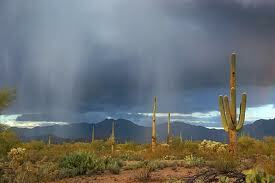 It’s that time of year in Arizona when we long for the monsoon to come and cool the temps by at least a few degrees. Early Saturday morning, toward the end of a lovely, meditative hike with my friend Beth and the three canines, I felt several drops of rain hit my arms and face. While scant raindrops might go unnoticed by most, we desert dwellers are on high alert, and treasure them even if only a few fall. I looked up to the sky. There were some rogue clouds – indeed, one which was producing this sprinkling – but certainly no monsoon-style, cumulonimbus towers. “You did one,” I replied. I was reminded of a classic lesson I learned many years ago reading the book The Isaiah Effect. In it, author Gregg Braden relays the story of having been invited by a Native American friend, David, to share in an experience of what he thought was to be a prayer for rain during a major drought. Gregg observed his friend’s short and silent ritual, after which David was ready to leave and get lunch. Puzzled and apparently expecting a longer and more participatory ceremony, he said he thought they had come to this place to pray for rain. “In my prayer, I began with the feeling of gratitude for all that is and all that has come to pass. I gave thanks for the desert wind, the heat, and the drought, for that is the way of it, until now. It is not good. It is not bad. It has been our medicine. Like David’s, Beth’s rain dance in her mind and heart had been a prayer for rain, though perhaps less intentional. And so began that morning’s desert lesson. Be careful what you pray for – you just might get it. It turns out that’s the title of a book by Larry Dossey MD. Dossey is known for his groundbreaking work exploring the role of prayer in healing. His research has led to what he calls the non-local mind and the merging of spirit and medicine. He says this book’s purpose is to help people gain the ability to reshape private thoughts for the benefit of mankind. Back at home after the hike; the lesson was presented as another reminder that our thoughts and feelings pack a punch. They are, as Braden, Dossey (and I) have witnessed, our prayers. Settling down to breakfast, I glanced at a post from the evening before. It was an account of an unfolding event in which a man’s three dogs were apparently stolen before his eyes. Even though it involved strangers, I had been shaken by it. I felt the man’s grief, as well as anger toward the person who, on the surface, appeared to be a perpetrator. I tried to wipe it from my previously blissful psyche. But my sadness prevailed. Then, suddenly, it dawned on me that I was praying for rain. I was further endangering the situation by amplifying my own negative emotions. 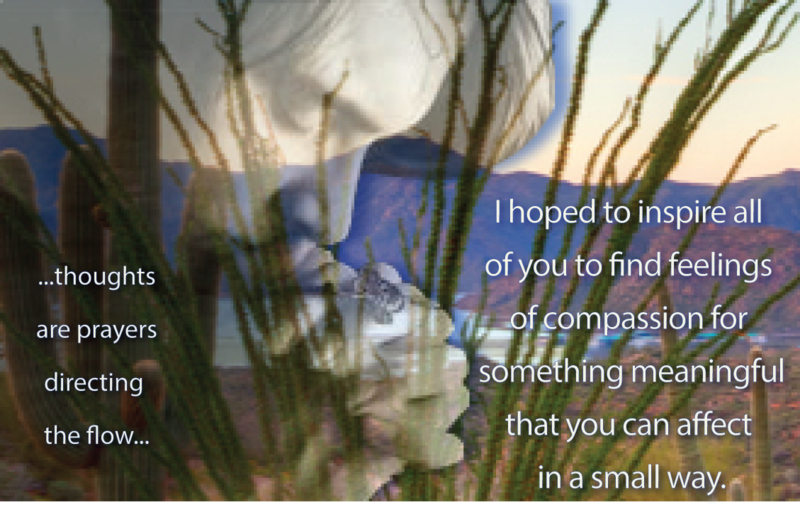 A calm came over me and I very simply and deliberately imagined – felt – a positive outcome. Even more importantly, I reframed my feelings toward the woman suspected of wrongdoing. Reminded of the wise saying, “Let God handle the details,” I did not wish her to have a change of heart and return what she had purportedly stolen. I simply raised her up in my heart, in a loving and non-judgmental way. In my prayer, I asked that she connect with her highest and best self. One hour later, I saw a post confirming the outcome. The dogs had been returned and all was well. I don’t claim to fully understand the quantum mechanics of prayer, and I don’t believe my practice was solely responsible for this welcome outcome. Yet I know what Dossey says is true. Our private thoughts do impact the collective. Reframing emotions is not easy. I was able to reframe mine on this morning in good part because I just had walked in the rain that my friend’s mental dance had produced. This is the first lesson, spirited women, the one before the big prayer. Gather strength from the seemingly small or inconsequential miracles that you create with the resonance you put out through your thoughts and feelings. Your faith will build as you gain awareness of how very powerful you are. I’ve been observing my thoughts more than usual these last few days. The practice was sparked by a theme that emerged in many conversations with clients and friends. People seem to be lamenting (obsessing?) over situations in the past, situations that, despite the energy they put into wishing, cannot be changed. Or they’re worrying about future possibilities that have not yet arrived, even creating detailed mental causal chains. “If this happens, then I will have to do that, and then it will cause ____.” (Fill in the blank with the worst possible scenario). What if thoughts were prayers? What if our minds were sacred mechanisms that direct the flow of circumstances the moment we conceptualize them? I know this to be so in my own life. But just how does this happen? I’m educated as a scientist. While I haven’t worked in that field for many years, the analytical, hypothesis-forming style of thinking never left me. I find it fun as well as enlightening to examine seemingly un-scientific principles and figure out a tangible explanation for why they work. It’s a way of bridging the mysterious with the material. So this week I set out (once again) to determine some of the ways in which our thoughts become our reality. Part of it can be answered with a simple economics principle, opportunity cost. If my mind is engaged in futile or unproductive thinking, I quite literally miss out on the moment-by-moment opportunity to learn, teach, connect, find joy or simply observe. This week, I have gently coached others to adopt more discipline in their thinking in order to enjoy or seize the moment at hand. But there’s more. Why are obsessive thoughts so dangerous? After all, they’re fleeting and hidden in privacy of our minds. One problem is that they’re laced with emotion – negative thoughts are partnered with negative feelings, positive thoughts with positive one. Test it for yourself. The next time you find yourself thinking a pessimistic “what-if,” notice how it feels. If there’s fear or frustration, you’ll get what I mean. In contrast, the next time you have an inspirational or creative thought, notice how empowered and hopeful you feel. We are ever more likely to be productive and ultimately successful when we live in a positive emotional state. It’s logical then to conclude that negative thoughts literally stall movement in the direction we truly desire. If you’ve ever tried to shift your feelings unsuccessfully, try shifting what you’re thinking about instead. Not only does the clever brain partner thoughts with feelings, it attaches pictures. Much of the time, there’s an HD movie going on in our minds. Choose your entertainment wisely, because these trailers are predictive of the actual feature film. Yes, thoughts are prayers. And I can’t explain this coincidence. I’m glad there’s a spark of mystery left.